NEED TO MAKE A CLAIM OR HAVING PROBLEMS WITH AN EXISTING ONE? 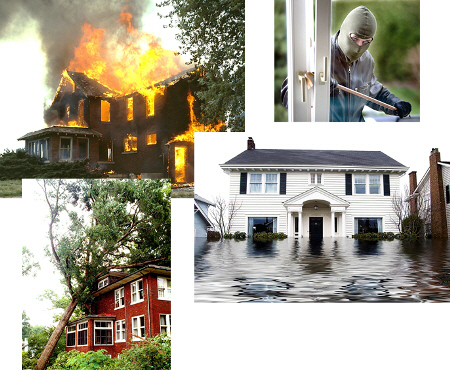 If you are reading this page, you may be in the unfortunate position of having suffered the trauma of a fire, flood or theft at your home or place of business. It is our sincere hope that this will be the first and last time you experience such a trauma! After the shock waves subside a little, naturally your thoughts turn to getting on with the task of restoration. When a severe problem occurs like a flood, fire or theft, a policyholder naturally reaches out to their insurance company in the first instance. WILL THE INSURANCE COMPANY’S ADJUSTER TAKE CARE OF YOU? 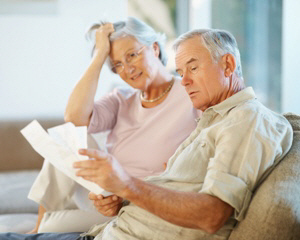 Very often, people’s first response is “My insurance company’s assessor will take care of it”. What this really means is that a “loss adjuster” acting for the insurance company has been instructed to visit them. But what you’re perhaps unaware of is that the loss adjuster acts on the insurance company’s behalf with their interests in mind – they don’t get paid to ensure you get your full claim entitlement! It’s bad enough having to suffer the physical and emotional heartache a catastrophe brings. However, what often follows next can make a really bad situation – dire! 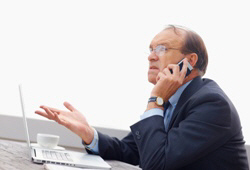 Frustration – probably after many time consuming calls, your insurer will eventually send round their loss adjuster. You Must Use Our Suppliers – the loss adjusters and/or the insurers will try and insist that you use their contractor for building work as well as their suppliers for carpets, jewellery, electrical items and more. instance. Passed From Pillar To Post – your claim will never be dealt with by one individual. The claim will not be in your control and because a number of different people will be involved, the process will become increasingly frustrating and time consuming – time you will want to spend organising your home and work/business commitments and most importantly – getting on with your life! Consider a true story of a typical situation drawn for our own case files. We were instructed by a seventy year old gentleman to assist with a claim for serious fire damage caused at his house a week earlier. By that time, a week after the fire, he had spoken with eleven people already involved in the claim process with the prospect of a further six to follow and thus had SEVENTEEN contacts to make! WHY NOT LEAVE THE WORRIES OF YOUR INSURANCE CLAIM TO THE PROFESSIONALS? Nobody would go into court without professional representation, or see the Inland Revenue without speaking to their accountant first. So why try and handle a big insurance claim without professional help? 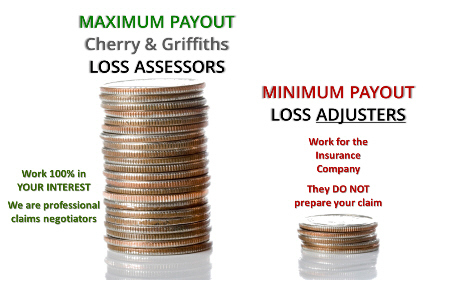 Cherry & Griffiths are claim consultants and insurance loss assessors who feel passionate about the injustices dealt out to policy holders by both domestic and commercial insurers due to the inadequate and inefficient manner in which they deal with the majority of claims. What’s more we also assist commercial clients with their business interruption claims – against their own insurers or against a responsible third party. Technical and practical expertise – our senior team includes 6 highly experienced “claims” professionals with in excess of 200 combined years claims handling experience and two of senior management team are Chartered Loss Adjusters who know all the tricks of the insurance company trade! Stress Relief – we will be your sole point of contact going into battle on your behalf making all the requisite calls to the insurers and Loss Adjusters. Control – we control your situation by working together with loss adjusters to progress the case to completion as quickly as possible. And we will always respond to telephone messages at the earliest opportunity. 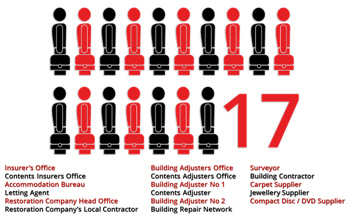 In most cases you will be able to choose your own contractors/suppliers. TRUST US TO TAKE CARE OF YOU WHEN HELP IS NEEDED MOST! C&G are proud of their ethical approach and do not indulge in pressure selling. We will tell a potential client only what we believe that we can achieve and then walk away and leave them to make their decision to about whether to engage our services. As a result, over 80% of new cases come from recommendations of previous clients! It’s never too late to ask for our advice. We will always visit a potential client to carry out a free no obligation review of their position and advise how we believe that we can be of help. We also specialise in resolving contentious claims when it has all gone wrong, unlike most other assessing firms. So whether you have a residential, commercial or industrial claim.